Butler Bulldogs Nike Dri-Fit Coaches Tee Men's Size Large New With Tags Buyer pays $3.05 shipping This item was purchased from an Auction or a Sale. We buy at these types of places and resell. We are not retailers and will tell as much about the product as we possibly can. Please feel free to ask any questions. Shirt is gently used and in excellent condition! Butler Bulldogs Nike Dri-Fit Legend Tee ”Gritty Not Pretty” Men's Size Large New With Tags Buyer pays $3.05 shipping This item was purchased from an Auction or a Sale. We buy at these types of places and resell. We are not retailers and will tell as much about the product as we possibly can. Please feel free to ask any questions. Buy it now is a great Butler Bulldogs NCAA Nike Tee Shirt Short Sleeve: White- Mens Size XL. Condition is Used. In good shape. See photo. The price for this this shirt $4.99. Measurements for this: length is 28” pit to is 23” Shipped with USPS First Class Package. Butler Bulldogs Nike Dri-Fit Legend Tee Men's Size Large Athletic Cut New With Tags Buyer pays $3.05 shipping This item was purchased from an Auction or a Sale. We buy at these types of places and resell. We are not retailers and will tell as much about the product as we possibly can. Please feel free to ask any questions. You are looking at a great Nike Dri Fit Navy Blue Butler Bulldogs Embroidered Polo or Golf Shirt. The shirt has a great classic look. The shirt is a must have for your wardrobe. The shirt is a size XL. You are looking at a great Nike Dri Fit Butler Bulldogs Blue Striped Polo or Golf Shirt. The shirt has a great classic look. The shirt is a must have for any fan's wardrobe. The shirt is a size XL. You are looking at a great Nike Dri Fit Butler Bulldogs Blue Embroidered Polo Golf Shirt. The shirt has a great classic look. The shirt is a must have for any fans wardrobe. The shirt is a size small. Butler Bulldogs ”Let’s Go” Nike Core Cotton Tee Men's Size Large New With Tags Buyer pays $3.05 shipping This item was purchased from an Auction or a Sale. We buy at these types of places and resell. We are not retailers and will tell as much about the product as we possibly can. Please feel free to ask any questions. 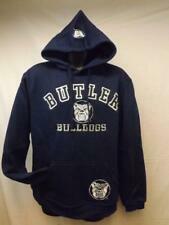 Time Out Butler Bulldogs - Navy Blue Cotton Sweatshirt (L) - Used . Under Armour Butler Bulldogs - Navy Poly Long Sleeve Shirt (L) - Used . You are looking at a great Nike Dri Fit Butler Bulldogs Gray Polo or Golf Shirt. The shirt has a great classic look. The shirt is a must have for your wardrobe. The shirt is in great gently used and well cared for condition. BUTLER BULLDOGS. GRAY IN COLOR. 70% COTTON 30% POLYESTER. EMBOSSED GRAPHIC. The jersey is in good used condition. 33" Length (top of shoulder to hem). Welcome to Kevin’s Clubhouse! Shirt Measurements: Armpit to Armpit is: 19 Top of Shirt to Bottom of Shirt Length is: 28 Sleeve Length: 6 Item Notes: Brand New Without Tags. $5 to ship! Thank you for visiting the clubhouse! Please message me with any questions on this item! I will be more than happy to answer anything you may need! I don’t cancel orders so if you buy it, please pay. Also, if you have a chance, please check out the rest of my items in my store! We do combine shipping and we also update the store daily with new items for sale! We appreciate your business! You can follow us on instagram @kevinsclubhouse or on facebook at Kevin’s Clubhouse’ Business Page! Butler University Bulldogs men's XL graphic t-shirt Champ's Sports Gear . Condition is Used. No holes or stains Shipped with USPS First Class Package. Team: Butler Bulldogs. Material: 100% Cotton. Manufacturer: Gear For Sports. The shirt is in excellent used condition. Welcome to Kevin’s Clubhouse! Shirt Measurements: Armpit to Armpit is: 23 Top of Shirt to Bottom of Shirt Length is: 28 Sleeve Length: 5.5 Item Notes: Excellent like new condition. Rare tee. Free to ship! Thank you for visiting the clubhouse! Please message me with any questions on this item! I will be more than happy to answer anything you may need! I don’t cancel orders so if you buy it, please pay. Also, if you have a chance, please check out the rest of my items in my store! We do combine shipping and we also update the store daily with new items for sale! We appreciate your business! You can follow us on instagram @kevinsclubhouse or on facebook at Kevin’s Clubhouse’ Business Page! 80% Cotton 20% Polyester. make Supersized seem small. New (see photos). Item: Steve and Berrys Butler University Sweatshirt. Free to Lower 48 States. Welcome to Kevin’s Clubhouse! Shirt Measurements: Armpit to Armpit is: 23 Top of Shirt to Bottom of Shirt Length is: 30 Sleeve Length: 7 Item Notes: Brand New With Tags. $5 to ship! Thank you for visiting the clubhouse! Please message me with any questions on this item! I will be more than happy to answer anything you may need! I don’t cancel orders so if you buy it, please pay. Also, if you have a chance, please check out the rest of my items in my store! We do combine shipping and we also update the store daily with new items for sale! We appreciate your business! You can follow us on instagram @kevinsclubhouse or on facebook at Kevin’s Clubhouse’ Business Page! Item in the photo are the exact item you will receive. Measurements in photos are pit to pit, as well as back of collar to the base of the shirt. We will combine shipping for multiple purchases. Domestic shipping only. BUTLER BULLDOGS T-shirt. Size Large. 100% Cotton. 100% GENUINE?. No Stains or Snags.